What is a game drive and how does it work? ​Although most people come to Africa to see the wildlife on game drives, not many people know what to expect. 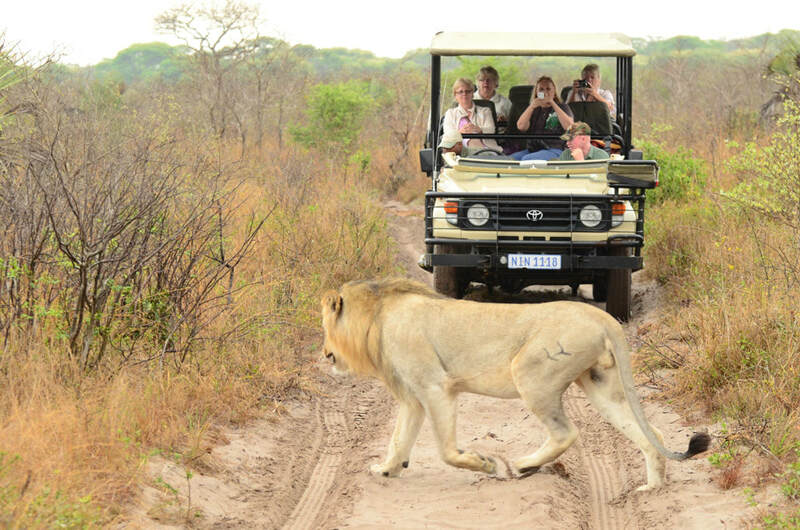 A game drive allows you to approach wild animals from the safety of a vehicle. Most animals are afraid of people, thus staying as far away from them as possible. They, however, have no such aversion towards vehicles. In a vehicle, you can approach animals much closer, without disturbing their natural behavior. They view vehicles as a single object, which they do not associate with people. You can, therefore, safely view lions from an open safari vehicle without fear of attack. It is, of course, of the utmost importance that you remain quiet and the silhouette of the vehicle stays unbroken (by camera lenses or arms sticking out of the window), so animals keep viewing the vehicle and its occupants as a whole. In safaris terms, this is called a lion sighting. As long as everyone in the car follows the guide's instructions and nobody breaks the silhouette of the car, you can enjoy this special moment without any problems. This also goes for the lion: he won't pay attention to the car nor its passengers. This is forbidden, could lead to a fine and/or ban from the park and could scare the animal which may flee or attack. This behaviour may lead to a fine and you may be banned from the park for a specific number of weeks without a refund. Stay vigilant as animals do walk through these viewpoints or picnic areas, even though most animals avoid them due to the high number of people. Keep close to your guide and do not walk in dense vegetation. You may encounter animals that seem tame, monkeys or birds trying to steal your food. This usually is due to people encouraging animals to become accustomed to humans. In most cases these animals will have to be shot. Should you encounter seemingly tame animals, keep your distance as these are still wild animals and they could be dangerous. Keep a safe distance from animals and be particularly careful with elephants. 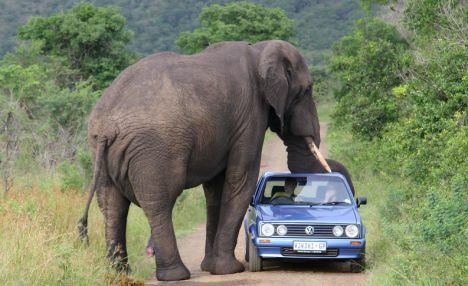 Elephants are much larger than the average car, very strong and should therefore be treated with respect. It is difficult to provide a general guideline but give the animal space (about 30 metres). If it barely reacts to your presence and continues with what it was doing, you probably can drive a little closer. Be aware, however, that elephants and rhinoceroses can suddenly turn on you faster than you think. Beware of elephants in musth. Some male elephants may be in a phase called musth. This means that they seek out females with whom to mate and are willing to fight with other males if necessary. An elephant in musth can respond aggressively to cars. There are two ways to identify an elephant in musth: its back legs will be wet from urine and it'll have wet spots between its eyes and ears. In addition, a musky odour can sometimes be smelt in close proximity to the animal. Should you see an elephant in musth, it'd be wise to give him extra space. Do not attempt to get closer to him or to pass him if he's standing right next to the road. Be wary of small crossing animals! You may see tortoises, chameleons, snakes and dung beetles walking on the road, especially in summer. These are all too often overlooked and run over. So keep an eye on the road and if you do spot one of these animals, give them right of way! In the event of a vehicle breakdown or if you get stuck, do not leave your vehicle to go get help. You may push your vehicle or change a tire, as long as you’ve put someone on lookout duty. Make sure you stay within three meters of your vehicle. ​Should you encounter a dangerous animal whilst on foot: stand very still and do not run! In most cases the animal is as startled by your presence as you are by it, and will soon run away. Only once the animal is out of sight, can you walk backwards (do not turn around) to the car. If the animal does not run away, you will need nerves of steel to remain standing still. Making yourself seem bigger often helps, shout loudly at the animal (do not scream) and clap your hands. You'll demonstrate your dominance and thus chase the animal away. If you fear you do not possess nerves of steel, rather book a guided game drive, or make sure you do not step out of your car. Always keep away from an elephant in musth. When and how long are guided game drives? Animals are most active early in the morning and late in the afternoon. These game drives always leave very early, often before sunrise. Expect your 3-4 hour game drive to depart around 5AM from November to March and around 6AM the rest of the year. During the game drive coffee and snacks are often provided. The rest of the day you are free to relax or even take an afternoon nap. Depart on a 3-4 hour afternoon game drive at 4PM (3PM, April to October) Expect a midway stop for a sundowner, which entails snacks and drinks whilst watching the sunset over the wild landscapes of Africa. At dusk you will be driven back to your accommodation where dinner will be served.